Do you want to die with dignity? There is a coupon for that. Business Insider has another post that explains Valeant's business model. They bought an out-of-patent drug (Sodium Seconal) which is used in physician assisted suicide - and after the California government passed laws to make the above legal they jacked the price up to $3000. The Skeptic goes one step further - and points out consistent with Valeant's business model there is a copay coupon so that you, dear patient, are not out of pocket, whilst your insurance provider takes the hit. Reprinted in full without comment. Source here. In my 21-year history as a governance investor, I cannot think of another example in our portfolio where a board has behaved as poorly as you have in your response to the Valeant merger proposal. Your scorched earth response to Valeant is beyond the pale. You have accused Valeant of fraudulent accounting and of falsifying its reported growth rates and business performance, and you have done so without factual evidence to prove these assertions. If one spreads false and misleading information for the purpose of driving down Valeant’s stock price, that is market manipulation, plain and simple. That a board of a $50 billion market cap company would engage in such behavior as a defensive tactic is extraordinary and incredibly inappropriate. Valeant has offered to acquire Allergan for $72 per share in cash and 0.83 shares of Valeant common stock representing a 50% premium to Allergan’s unaffected price, a transaction in which Allergan shareholders will own 44% of the combined company. 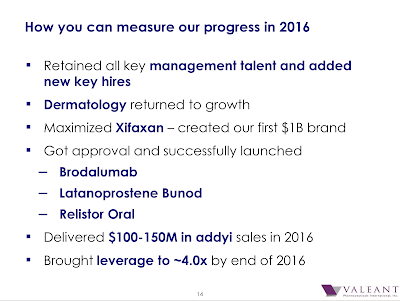 In addition, Valeant has offered to issue a CVR to share the value of DARPin with Allergan shareholders. Valeant has raised its bid twice, lastly in response to feedback we received from what we believe to be a representative sample of the largest institutional, long-standing shareholders of Allergan. 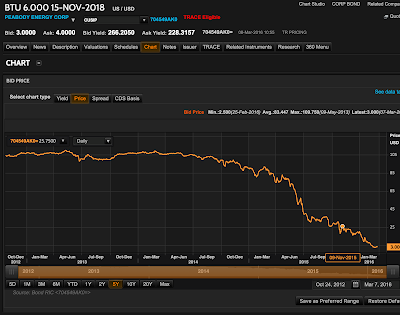 We remind you that the current value of Valeant’s stock does not reflect the value ultimately received by Allergan shareholders because Valeant’s stock currently trades at a substantial discount due to Allergan’s scorched earth, negative information campaign against Valeant, the uncertainty of transaction consummation due to Allergan’s defensive tactics, and the resulting delays in time to closure. Nearly 90% of Allergan stock has changed hands at prices above $160 per share since the Valeant bid was made public. We believe that a substantial portion of these shares have been purchased from long-standing investors of Allergan that do not believe that the current market prices are reflective of Allergan’s value as an independent enterprise, and/or have lost confidence that the board and management will act in shareholders’ interests. These investors are sending a strong and clear message to the board that it is time to negotiate a deal with Valeant. Meanwhile, the board continues to stick its proverbial head in the sand. By refusing to engage with Valeant, we believe that you have breached your fiduciary duty of care and ultimately your duties of loyalty and good faith. Valeant is not offering to buy Allergan for cash, rather the majority of the consideration is in the form of common stock of the combined enterprise. As a result, the value of the consideration is contingent on the future value of the merged company, 44% of which will be owned by Allergan shareholders. When a stock transaction is proposed between two similarly-sized enterprises like Valeant and Allergan in which the target shareholders will own a large percentage of the acquirer, the value of the combined company can only be determined by a detailed analysis of transaction synergies, strategic overlap, future business plans, and other factors. This information can only be obtained by engaging with Valeant. It is difficult to understand how you can be satisfied that you are exercising due care when you are refusing the opportunity to review available information that is critical to your decision. Based on Allergan’s public attacks on Valeant’s business, it is manifest that you do not have an adequate understanding of Valeant for you to fulfill your obligation to determine whether the transaction is in the best interest of Allergan shareholders. Why did Mr. Pyott sell $31 million dollars of common stock at $123 per share in February of this year? Why did other executives sell an additional $57 million of stock at $119 dollars per share in the first quarter of this year? Why did the compensation committee award millions of dollars of restricted stock and options to management earlier this year based on management’s sandbagged earnings targets? 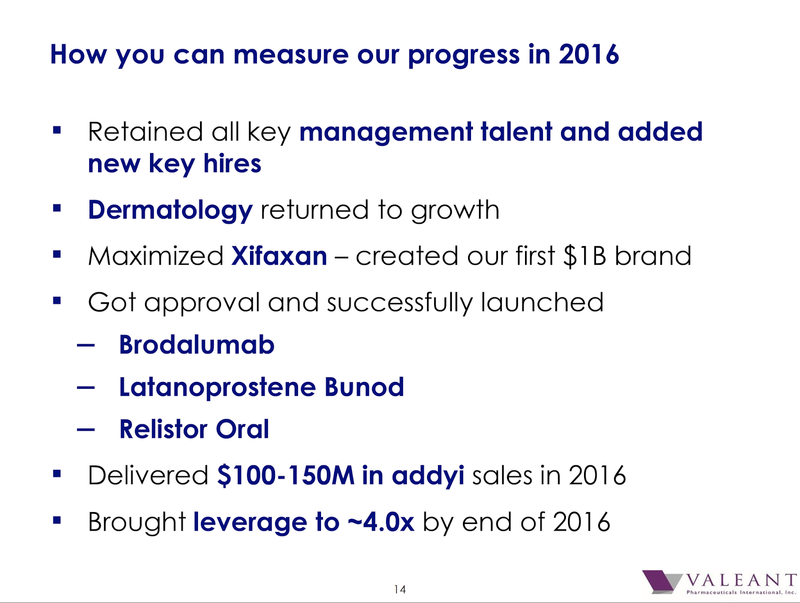 We note that just prior to the Valeant offer, Allergan management had announced an “aspirational” earnings growth rate of ~15%. Two weeks after the Valeant offer, management increased its guidance to 20% compounded earnings growth over the next five years. Remarkably, Mr. Pyott is now hinting that guidance will be raised yet again on the upcoming earnings call. Why is Allergan contemplating taking on billions of dollars of leverage and initiating a multibillion dollar buyback at a likely substantial premium to today’s stock price when it was unwilling to repurchase stock less than a year ago at half of today’s stock price? Why is the company now considering making a major acquisition? If such a value-creating transaction were available in the past, why did the company not act on it then when the market for pharma deals was less heated? Why would Allergan wait until its negotiating leverage has been impacted by every seller’s knowledge that management is desperate to do a deal to “defend” the company from being acquired? How can the board ignore the fact that Goldman Sachs, Allergan’s financial advisor, immediately prior to the announcement of the transaction (before it was required to suspend coverage), had a price target for Valeant of $164 and had Valeant on its “Conviction Buy List”? At $164 per Valeant share, we note that the Valeant deal is worth $208 per Allergan share. How can the board ignore the valuations and target prices that its own advisers had for Allergan and Valeant before they were hired to “defend” the company? In June of last year, Goldman Sachs raised $2.3 billion as Valeant’s sole underwriter of its equity offering. Why would Goldman Sachs have assumed sole underwriter liability in doing so if Valeant’s financial statements are fraudulent as you have suggested? We note that in Allergan’s 14D-9, the inadequacy opinions Allergan obtained from the company’s bankers expressly state: “We do not express any view on, and this Opinion does not address, the fairness, from a financial point of view”... of the Valeant offer. Why didn’t the board insist that the company’s financial advisors complete a fairness analysis of the Valeant proposal before determining that it was inadequate? How can the board have adequately informed itself of fairness of the Valeant proposal if it did not receive a fairness analysis from its own advisors? Members of the board of directors of a Delaware corporation faced with a takeover bid are required to inform themselves of all material information about a transaction, and then act with care in evaluating it. By failing to authorize your advisors to meet with Valeant to address any of the board’s stated concerns about its organic growth, accounting, business sustainability, or synergies, the board and its advisors have failed to do a reasonable investigation of the Valeant transaction. As a result, we believe you are in breach of your fiduciary duties, and have otherwise not acted in good faith. We would have expected more from you based on your personal career track records up until this time, and what we have heard about some of you from individuals we know in common. I had hoped that your initial approach to this transaction was an ill-advised negotiating strategy, but the passage of time and your continued misinformation campaign about Valeant have caused us to conclude that you are no longer fit to serve the interests of shareholders. As a result, we have recruited a group of extremely talented executives and experienced public company directors who understand their fiduciary duties and have a track record of acting in the best interest of shareholders and the companies they have managed as CEOs and as members of their boards of directors. We encourage you to review the backgrounds of the individuals on our slate who have agreed to serve on Allergan shareholders’ behalf. They will bring to the board room superb track records in creating and maximizing shareholder value coupled with excellent transaction skills, accounting expertise, broad business experience and healthcare and pharmaceutical industry domain expertise. We would be surprised if some of you do not know, or know of, the individuals who have agreed to serve. Ask yourself why a group of high quality individuals, who certainly don’t need the directors’ fees, have agreed to replace you at the shareholders’ behest on Allergan’s board. The bottom line is this: it is time for you to look at yourself in the mirror and ask yourself whether your behavior as a director of Allergan is appropriate and consistent with your long-term personal reputation and the way you would like to be perceived and judged by institutional and retail investors, the general public, and members of your community and immediate family. Ask yourself whether your approach to this transaction has been business-like and professional, whether you have been adequately informed by management and your advisors about Valeant, and whether you have fulfilled your duties of care, loyalty and good faith as a director. Ask yourself whether if you had half your net worth invested in Allergan stock (and were not otherwise conflicted by being a member of management) the approach you have taken is consistent with maximizing value for shareholders? We believe the vast majority of Allergan’s shareholders are extremely concerned that, to date, you have not fulfilled your fiduciary duties. Perhaps more significantly for you personally, you have harmed your reputations as corporate citizens. We remind you that it takes a lifetime to build a reputation and only a few minutes to destroy it. Rather than attempt to delay the inevitable and further damage your reputations, we ask that you stop this nonsense, and authorize prompt negotiations with Valeant. If, as part of your due diligence on Valeant, you and/or advisors discover the malfeasance that you have suggested exists, then as Allergan’s largest shareholder with a $5 billion investment we would of course strongly oppose a Valeant transaction. If, however, your due diligence determines, as we (after the completion of our own detailed due diligence) and other major Allergan shareholders who own stock in both companies have concluded, that Valeant has built a well-managed, decentralized, disciplined specialty pharmaceutical manager, operator, and acquirer which offers tremendous strategic overlap and synergies with Allergan, then first apologize, and then negotiate the best deal you can for Allergan shareholders. Valeant has publicly stated that it is open to further negotiations if the board engages promptly in good faith negotiations. We are now working to obtain the consents to call a special meeting, and upon their receipt, we will ask the board to call the meeting. While under the company’s highly restrictive and cumbersome special meeting mechanics, you have the ability to delay the meeting for up to 120 days, we on behalf of Allergan’s other shareholders ask that you do not delay the inevitable any further. What legitimate board of directors attempts to silence or otherwise delay hearing what its own shareholders have to say? Shareholders are looking forward to expressing their views. A technical question on Herbalife for Mikeo: What happens to distributorships on the death of the distributor? This is a question for those who have spent too much time thinking about good versus not-so-good multi-level marketing schemes. I apologise in advance for the very narrow subject matter. @mikeo188 is an anti-Herbalife account on Twitter. (S)he is very well informed seeming to know the news from the anti-Herbalife camp before it is public. As someone who is long Herbalife (and has done considerable work) I still take Mikeo seriously. It is Bronte's policy to seek out opponents of our views so we can test their arguments. Mikeo asked me if I had seen the ESPN piece on Advocare. Sure. Then asked me what the difference between Advocare and Herbalife was. I said plenty if you looked on the ground (and I have looked on the ground). But I want to ask a question in response. 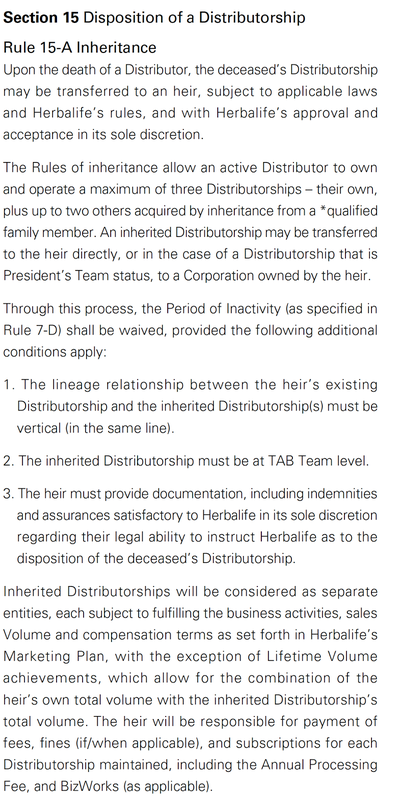 Herbalife and Advocare have very different policies as to what happens to the ownership of a distribution business on the death of a distributor. 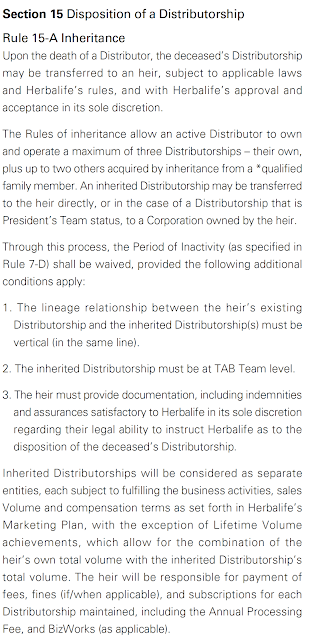 It is in the full document somewhat more complicated - but the sentiment is that a distributorship ends at the death of the distributor and the upline distributor then gets the income. It is very hard to maintain a distributorship even with an active will. The Herbalife rules are designed to ensure the continuity and inheritability of the business. To the people who claim to have done all this research into Herbalife - can they please explain why Herbalife has such different rules? Valeant is planning to have a conference call to "discuss preliminary fourth quarter 2015 financial results and update 2016 financial guidance". It is "preliminary" because numbers have not been audited yet. I expect an audit statement to be coming. I have never had a major problem with Valeant's GAAP numbers (which are terrible). My objection to their numbers is largely to the non-GAAP earnings that they promulgate widely and which are widely quoted by analysts. I suspect ultimately their auditor may not have major problems with the GAAP numbers (other than certifying that Valeant is a going concern). The GAAP numbers don't smell wrong. In that vein I have only main question. Can you break down your guidance for non-GAAP "cash EPS" into your estimated GAAP earnings and your budgeted non-recurring or non-cash expenses (such as restructuring expenses or amortisation) that I should ignore for the purposes of your GAAP EPS? I ask this because Valeant non-GAAP numbers ("cash EPS") bear only minimal resemblance to the numbers in the accounts. Some of the difference between GAAP EPS and "cash EPS" is clearly justified. Some less obviously. But from the outside it looks like business divisions can make their non-GAAP numbers by producing reasonable enough GAAP numbers and then marking any inconvenient expenses as "non-recurring". If a budget for non-recurring expenses is published this will help vouch for the integrity of non-GAAP numbers. There is a follow on question: given the GAAP numbers are "messy" some covenants will be broken. 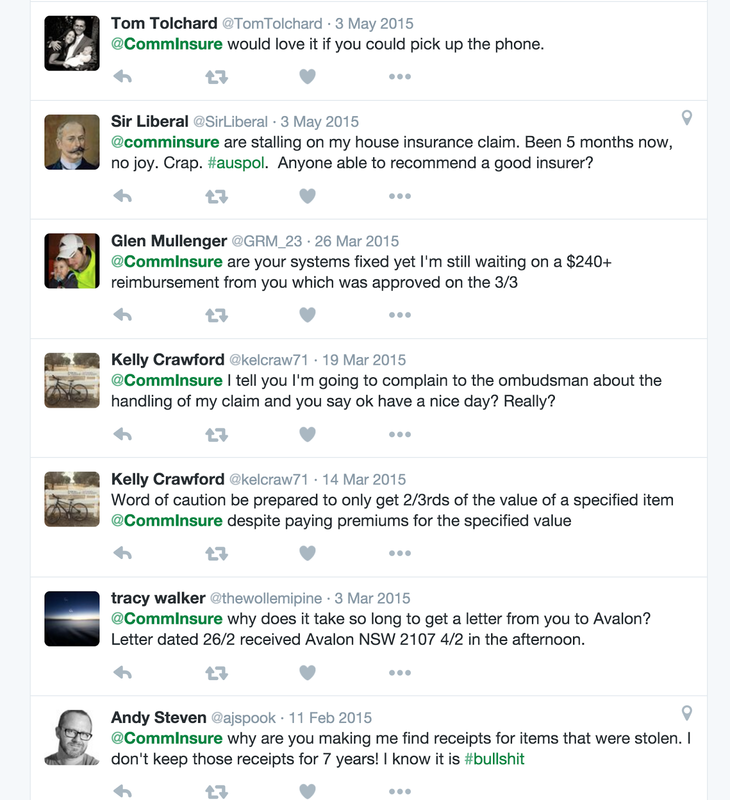 Can we have a list of broken debt covenants and a list of the consequences of those breaches? To my understanding the main consequences are restrictions on further borrowings and cash-traps for the benefit of debt holders if businesses are sold. However the documents are extensive - and there may be issues I am unaware of. The LA Times has a savage little article on herpes (or cold sore) topical medication. In Australia you can buy small tubes of Zovirax topical medication for about $15 over the counter. In America it is somewhat more complicated - and an insurance company winds up paying about $2500. After the exposure of Philidor (which was a device to deceive insurance payers) it can't be long until Valeant gets total payment kick-back. Citron has published on J2 Global (JCOM). Far more detailed than my earlier posts on that company. It is no secret that US coal companies are financially stretched. 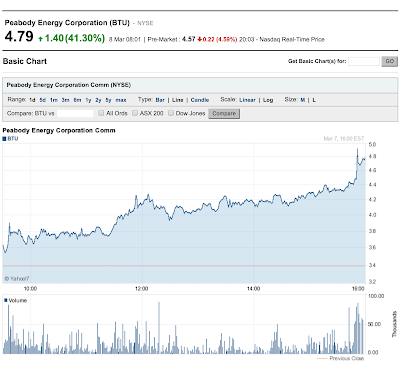 But Peabody Energy is particularly stretched. 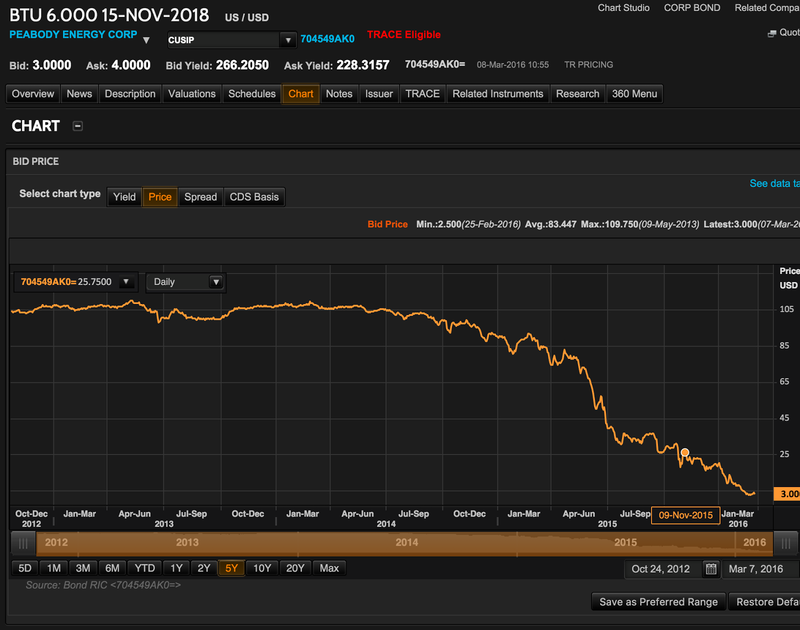 Here - courtesy Thomson Reuters - is a price chart for the 6% coupon Peabody debt due November 2018. Its a large issue with almost 2 billion at face value outstanding. The price is 3. That is 3 cents in the dollar. The yield to maturity is 266 percent. If Peabody survives without a restructure this piece of debt will make you over thirty times your money. Obviously the debt market thinks that Peabody is dead. Dead parrot dead. Go tell that to the equity market. 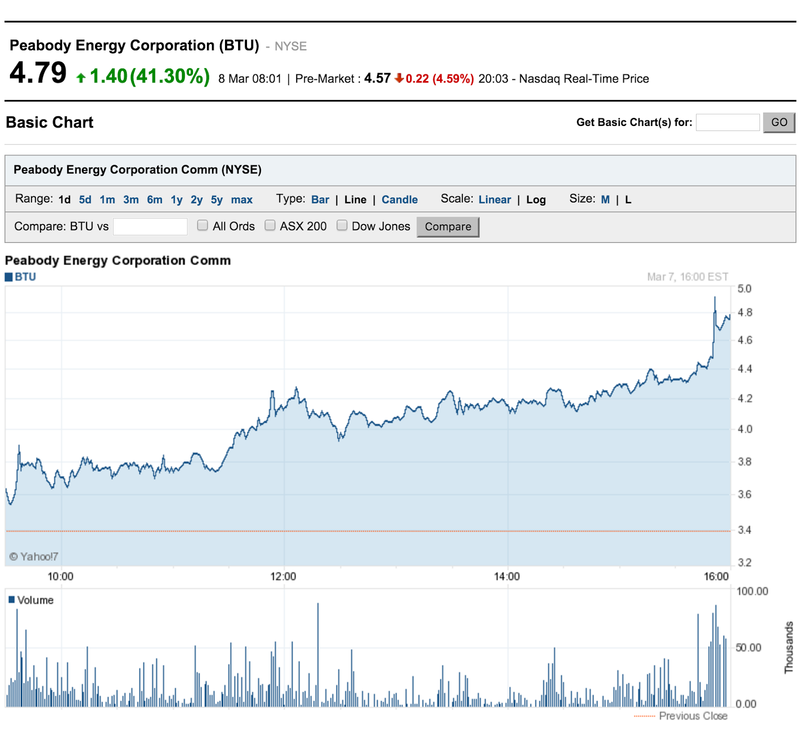 This is Peabody stock yesterday courtesy Yahoo Finance. Yes the stock was up 40 percent. And if the company survives it is vanishingly unlikely to be a thirty bagger. So it is kind of obvious that you should be long the debt, short the equity. It is very hard to construct a scenario where you lose. Except that it was darn obvious 100 percent ago in the trade. So here is what happened. Some wise-cracking hedge fund put on the trade, long the debt, short the equity. Can't lose except that they did lose. The debt has come down rapidly from 25 to 3 wiping out the long side of that transaction. The equity has doubled. And our hapless manager - having been perfectly rational - is left nursing some sore losses. This is happening all over the energy complex at the moment. Debt and equity markets disagree and the disagreement has got wider and wider. There will be some very bruised arbitrage managers this week. PS. Disclosure in order. We have a few of these trades on in tiny size. We are down low-single-digits this month. We are not enjoying it. But we are enjoying it far more than the soon-to-be-out-of-work manager who decided to put the Peabody trade on. 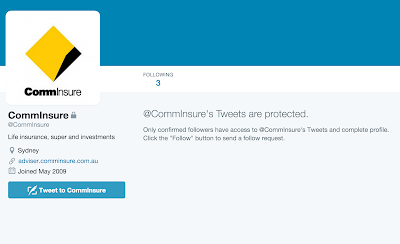 Commonwealth Bank of Australia (CBA) last year faced a devastating expose of their financial planning business by Four Corners. Four Corners is the premier current affairs program of the ABC*. You can find that program here. After the travesty detailed by Four Corners CBA promised to be the "ethical bank". 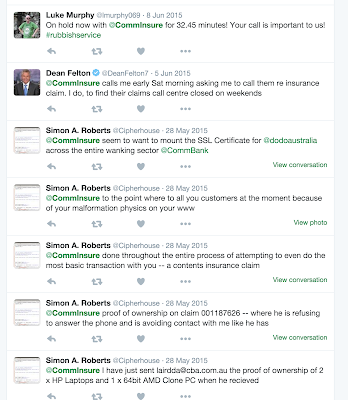 Today Four Corners was back with an expose as to how CBA has systematically denied insurance claims for trauma and other medical maladies. This was through their business arm called CommInsure. Amongst the allegations: medical files just disappear from their system. Yeah - the Twitter account disappeared too. Looks like another cover-up albeit badly executed. 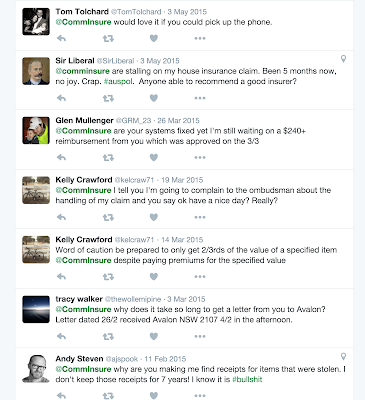 Maybe the Twitter account was never there - but searching @CommInsure on Twitter gives a fairly consistent history of reluctance to pay claims. This is an extract from the timeline well before the Four Corners episode. The whole stream is littered with claims complaints. If the senior brass did not know this is wilful ignorance. PS. All this is indicative of a "make the numbers or else" management style. Head office claims ignorance of what happens in the periphery even though it is obvious to those that look. *For non-Australians think of the ABC as the Australian version of the BBC. You will not be far wrong. This blog only infrequently wades into Australian politics - but the negative gearing debate has large economic and financial market implications. Moreover I am going to express an opinion moderately contrary to my self interest. Financially I would love the Labor Party policy to abolish negative gearing to be implemented (I am short Australian banks). But intellectually I think the Labor Party is mostly talking nonsense. In Australia you can deduct losses that you might make in renting a house against your ordinary (wages) income. This includes interest losses. This is widely thought of as a tax incentive or even a tax rort. The aggregate amount of losses taken against tax is about 1% of GDP which is - to be blunt - a very large number. Negative gearing is widespread and part of our culture. Moreover it is widely considered to be beneficial to have tax losses. I have had taxi drivers patiently explain that it is better not to pay principal on loans to buy investment properties (ie buy-to-let properties) because you want to keep the tax deductions as large as possible. The Labor Party has promised to "abolish negative gearing". This has been a policy agenda for fringe groups (notably affordable housing activists) for some time. Is negative gearing even a tax concession? But lets lay out the argument. Imagine I have two business enterprises. One works well and the other one fails. One makes $120. The other loses $100. My net gain is $20. If the tax rate is 30% I will pay $6 tax on on the net gain. Now suppose that I can't deduct the losses against the profits. Then my loss will cost me $100. But my gain will be taxed at 30% and I will gain only $84 after tax. I will be $16 out of pocket. There is a case for quarantining losses - and it is done all over the place in tax policy - but almost everywhere the case for quarantining is anti-avoidance. The most famous example is that offshore losses tend to be quarantined against offshore income. The reasons are (a) the offshore losses are hard to audit and (b) the offshore income that it is quarantined against might not have hit the domestic tax base anyway. If you do not quarantine losses you can wind up with completely anomalous situations. For example Australian once had a 150 percent R&D tax concession. If something were certified as R&D all inputs to the process were entitled to a 150 percent tax deduction. Then some enterprising minerals processing company did some tweaking of their processing technology. It was legitimate R&D whilst they were measuring the efficiency of their processes. All inputs to that process (ie the minerals they bought) were deductible at 150%. The output only taxable at 100 percent. They bought say $10 million of minerals, processed them and sold $11 million worth of metals. But they got a net tax deduction of $4 million even though the activity was profitable and the real amount spent on R&D (ie the amount spent tweaking equipment) was tiny. Done on this scale the concession could - and did - produce tax losses for the mining company in the hundreds of millions of dollars. There was almost no limit to how large the tax losses could be. If these losses were not quarantined somehow they could erode the entire corporate tax base. But the issue here was a "clever avoidance scheme", not that quarantining is of a benefit in itself. And if you take the typical negative gearing case in Australia (a doctor or middle-income professional) buys a property and makes a real loss it is pretty hard to see how this is a "clever avoidance scheme". Its just a loss. And real losses are normally deductible. The Australian Treasury (for foreigners the main economic policy advice department of the Australian Government) publishes a "Tax Expenditure Statement" which estimates how much various tax concessions cost on the basis that money spent via a tax expenditure is economically similar to money a government might spend directly if it taxed the income and then gave it back through grants or similar. The tax expenditure statement gives a list of major tax concessions and lists two big housing related expenditures. First the imputed rent that you might receive owing your own house is not taxed even though it might conceptually be thought of as part of your income. Second the capital gains you might make selling your primary residence is not taxed (though it would be taxed if it were an investment property). They do not list negative gearing as a tax expenditure. The list of big tax expenditures can be found on page 8 of the Tax Expenditure Statement. Its pretty clear the view that negative gearing is not a tax concession is a minority view in Australia (though it is a view held fairly widely by senior tax people I have known and seems to be held by the Commonwealth Treasury). The general consensus that negative gearing is a tax concession and that the smart money should and do take advantage of it. And you find negative gearing all over the income spectrum including some high income earners (but very few mega-high income earners). I find negative gearing intellectually amusing. It is not a tax concession but after much marketing by the Property Council, various spruikers and the otherwise ill informed negative gearing has been in part responsible for pushing house prices in Australia to ridiculous levels. The Labor Party is careful not to ban negative gearing for existing property investments. If they did there would be squeals about retrospectivity. Also there would be dumping of property on the market by people who were no longer entitled to their tax concessions. But they do plan to ban negative gearing prospectively. So I will throw up a simple example that shows the implementation difficulties. Imagine a house that is positively geared. Rent is $800 a week and all outgoings are $700 a week. But the tenant trashes it. (This happens, not often but it happens.) There is $10,000 worth of maintenance. The landlord is out-of-pocket. Even after than $5000 net rent they collect in the year they are out of pocket. Does the Labour Party have an argument for quarantining that loss that is not an argument for quarantining all business income against wages income? If so I have not heard it. PS. I am not averse generally to the Scandinavian idea of income quarantining. However in that case all income from capital is separate for tax purposes from income from wages. I have not heard a good case for selective quarantining that is not an anti-avoidance case.